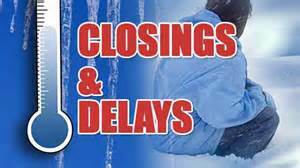 MISSOURI — Freezing rain and temperatures hovering around the freezing mark have resulted in a number of closings, cancellations and delays for Wednesday, February 27, 2019. This list will be updated as new information is received in the KMZU Newsroom. Carrollton R-VII — two-hour delay, classes in session at 10:00 a.m.